Dogs come in many shapes and sizes! As a pet parent, you know your dog is as unique as you are. They have their own unique tastes and needs that are different from those of other dogs. It can be a challenge finding the right treats for your unique best friend. But with careful consideration, pet parents can choose the right tasty treat to demonstrate their love and reward their dog. Let’s take a look at some tips for choosing the right dog chew. Did you know chewing is normal behavior for dogs of all ages? Not only that, but dog chews of all shapes and sizes are good for dogs – they’re known to have beneficial effects on dog’s teeth, gums, and jaws. It’s been shown that dogs that actively chew have less plaque and tartar build-up. Dogs who gnaw on natural beefhide chews for 30 minutes receive the maximum dental benefit. Pet parents should supervise their dog and remove treats that become too small. Read our blog article Smile Big for Pet Dental Health for more helpful information. 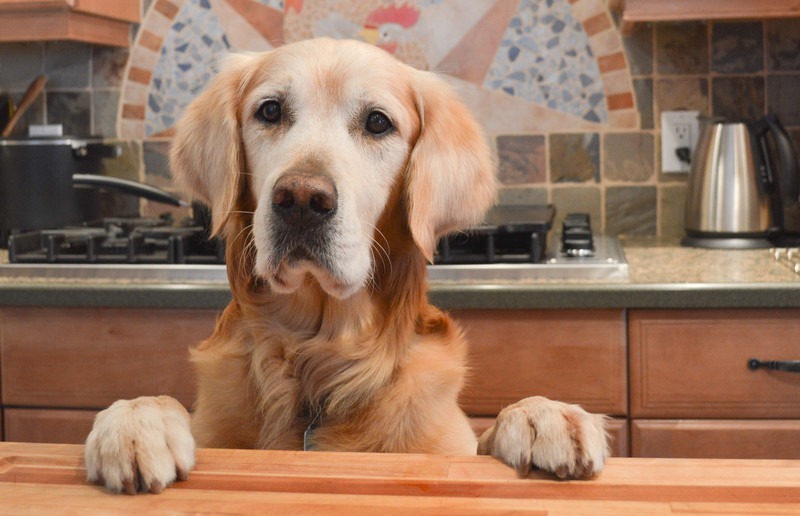 Pet parents can choose the right tasty treat to demonstrate their love and reward their dog. Match the size of your dog to the size of the bone. Bigger is not always better. Chews come in every imaginable size, so choose the right size for your pet. The chew should be large enough and thick enough so your dog cannot easily chew off and swallow a large piece or the whole chew. On the other hand, beefhide chews that are too big, requiring more than 7 days of chewing, should be replaced. You’ll need to do a bit of trial and error with your own pet to determine the best type. Match the type of chewer to the thickness of the treat. Vigorous chewers (you know who we’re talking about!) will do best with chews that contain many, thick fibers. Did you know – Pet Factory’s 100% American Beefhide chews contain more and thicker fibers than any other rawhide dog chew? For less vigorous chewers, choose a thick but lighter weight product to satisfy your pet, such as a smaller beefhide roll or a chip. Chews come in every imaginable shape and size, so choose the right one for your unique pet. Match your dog to their preferred flavor. Once again, this will require a bit of trial and error, but you will know pretty quickly which flavor your dog prefers. Pet Factory chews come in natural beefhide and a variety of fun flavors to suit your dog’s taste. Not every dog prefers flavored chews, but you never know until you try them. Mix it up with a new shape or type of dog treat. Combo treats and center core treats are fun options because they incorporate exciting flavors and textures within one treat. 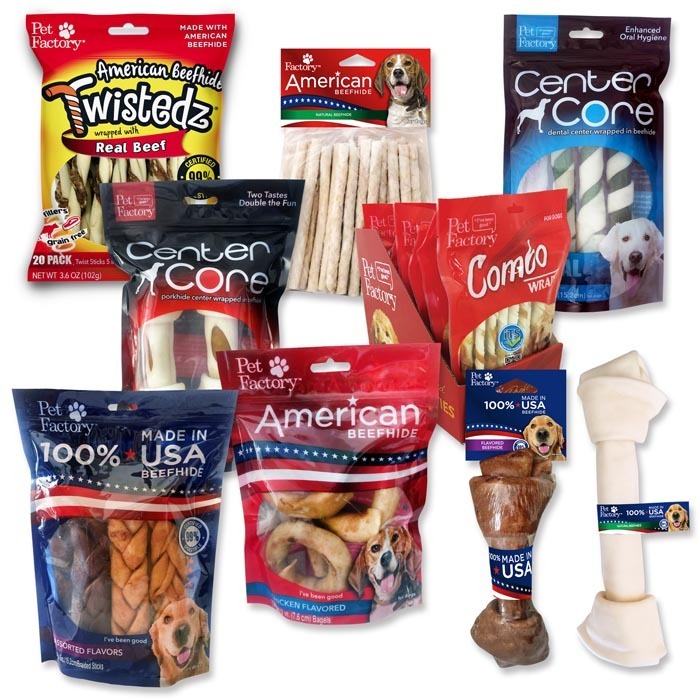 Beefhide bones, braids, sticks, pretzels, and donuts also add variety to your dog’s routine. Pet Factory’s new Twistedz beefhide combo chews twist real chicken meat or real beef meat around an American beefhide chew. These delicious, fun treats are 99% digestible, contain no corn, wheat, or soy, and are preservative free. Try something new – your dog will thank you! Beefhide chews are delicious, beneficial, and fun! Whether you shop for pet treats at your local retail pet outlet or online, you’ll want the best quality chew for your special dog. Variety is the Spice of Life! Mix it up with a new shape or type of dog treat. Shopping Tip: Be a smart consumer! Take the time to read the package label for the ingredients and country of origin. Look for Natural products that come in shapes and sizes that are suitable to your dog. Make sure the treats are durable, long-lasting, and made from American hides. Pet Factory beefhide chews fit the bill! Pet Factory beefhide chews are the Original Natural. In fact, we’ve been making all-natural beefhide products since 1989 – way before Natural became popular. Pet Factory is America’s leading manufacturer and distributor of USA-made beefhide chews. Our chews are made in our GFSI-certified facility and come in many shapes and sizes to satisfy every dog. Let your dog know they’ve been good by treating them to Pet Factory all-natural American beefhide chews today! Pet Factory is America’s Leading Manufacturer and Distributor of USA-Made Beefhide Chews, Premium Rawhide Products, Pet Toys & Accessories since 1989. PreviousPrevious post:Beefhide Chews – Tasty and Easy to DigestNextNext post:Pet Factory – American Beefhide Chews for 29 Years!